We’d love your help. 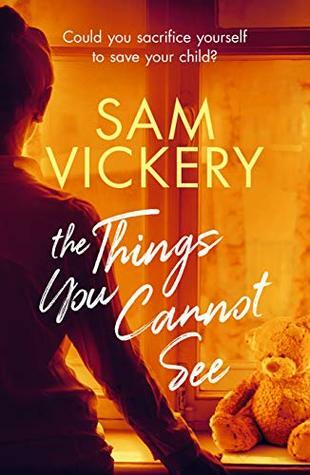 Let us know what’s wrong with this preview of The Things You Cannot See by Sam Vickery. What happens when the hand that rocks the cradle is broken? Megan Taylor was never good at anything, until she became a mother. Raising her first son, Toby, had been the happiest time of her life and she was sure that her second baby would bring her just as much joy. But it isn't long after Milo's birth when she realises that something is different. The bond she found so e What happens when the hand that rocks the cradle is broken? But it isn't long after Milo's birth when she realises that something is different. The bond she found so easy with her firstborn, is conspicuously absent. The harder she tries to force the feelings of maternal love, the more she struggles to even be near him. As Megan fails at the only thing she's ever been good at, her grip on reality begins to slip. There are only two things she can be sure of. She must not tell anyone the truth. And eventually, she will have to make a choice between herself and her baby. To ask other readers questions about The Things You Cannot See, please sign up. What happens when the hand that rocks the cradle is broken???" This is a departure from the authors' pervious novel, One More Tomorrow. However, she still brings out all the #feels! I've always been intrigued by stories of women feeling capable of doing harm to t What happens when the hand that rocks the cradle is broken???" This is a departure from the authors' pervious novel, One More Tomorrow. However, she still brings out all the #feels! I've always been intrigued by stories of women feeling capable of doing harm to their children. As a mom myself, this book was hard to read because I felt the exact opposite of the main character, Megan. Although, I am happy that I did read this book, in order to give me a better understanding of the validity of their feelings. I rated this book 4/5 stars. The writing was eloquently brutal, at times, but it was needed to provoke emotions within the reader. I really recommend that you read this book! Kuddos to the author, Sam Vickery!!! This is a departure from the authors' pervious novel, One More Tomorrow. However, she still brings out all the #feels! I've always been intrigued by stories of women feeling capable of doing harm to their children. As a mom myself, this book was hard to read because I felt the exact opposite of the main character, Megan. Although, I am happy that I did read this book, in order to give me a better understanding of the validity of her feelings. I love Sams' books and always look forward to a new release. This one covers a very sensitive subject that will send shivers up the spine of any new mum. Sam had covered Megans' fight back to normality so well, and shows the terror anyone would feel in this situation, as well as the damage it can do to relationships. Well done Sam. Highly recommended. This book was binge worthy once I started it I didnt want to put it down. All the emotios are there and you fall in love with all the characters. I knew there was an issue with hormones and pregnancy but I never knew how bad it could be. I loved the story about how a mother would do anything for her children, as a mom I feel this is how all mom's feel but have seen this is not the case. It is a truly eye opening story about what motherhood can bring. I have just finished reading this book and wow, what an amazing read! There is something about Sam's writing style that really resonates with me, I feel a genuine roller coaster of emotion throughout her books. This book deals with a very difficult subject matter in a truly heartfelt way. This is the first book I have read in 2019 and I think it's going to be a hard act to follow! Highly recommended. This book was a recommendation that I received and the blurb intrigued me so I downloaded it. Wow! What a brilliant book, it had me hooked from the very beginning. I loved the way that the story built, the book was mesmerising. I would definitely recommend this book and I plan to read more by Sam in the future. WOW! Sam has done it again. I love her writing. It always pulls at one's heartstrings and covers such emotional subject matters. Her books bring me to tears so often. Her characters are strong and well developed and it feels like you are in the actual book experiencing everything firsthand. Amazing!